World War I veteran, cotton trader, insurance executive and legendary philanthropist, Joseph McKinley Bryan spanned the 20th century as one of North Carolina's prominent citizens. Junior Achievement Born on February 11, 1896, Joe was the second son of Bart and Caroline Ebert Bryan. Because of family and economic uncertainties during his formative years, he developed a strong work ethnic. When American joined World War I, Bryan enlisted. After the war, he joined a New York City cotton firm, learning the business from riding horseback in Haiti to seal cotton deals to trading cotton in the city. In 1923, Bryan became a member of the New York Cotton Exchange. On November 19, 1927, Bryan married Kathleen M. Price (at left), daughter of Julian Price, president of the Jefferson Standard insurance company in Greensboro, NC. In 1931, Bryan joined Jefferson Standard Life Insurance Company in Greensboro. As president of a subsidiary company, Bryan purchased Greensboro's only radio station -- WBIG.. Jefferson Standard continued to expand its broadcasting operations with the 1945 purchase of WBT in Charlotte and the 1949 launch of WBTV, the first Carolinas television station. Among his jobs, Bryan served as senior vice president of Jefferson Standard Life Insurance Company, chairman of Pilot Life Insurance Company and board member of the holding corporation, Jefferson-Pilot. 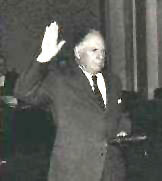 In 1993, he was named honorary and life time member of the board. Bryan served on numerous corporate boards, including NCNB and the Atlantic & Yadkin Railroad. His public service included work on the NC Governor's Committee on Low Income Housing, the U.S. State Department's Fine Arts Committee and chairman of the North Carolina State Board of Elections. In 1986, Bryan received the North Carolina Award in Public Service. In 1937, the Greensboro Jaycees asked him to help guarantee the inaugural purse for the 1938 Greater Greensboro Open professional golf tournament -- one of the oldest events on today's PGA TOUR. In 1955, the Bryan Family Foundation was created with education as a top priority. Universities throughout North Carolina have benefited from the Foundation. UNCG's School of Business and Economics was named his honor.